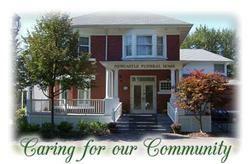 Our Facilities - Newcastle Funeral Home Ltd. Located in a beautifully restored historical century home, Newcastle Funeral Home offers the families we serve a comfortable and spacious setting at the time of their greatest need. From our bright and airy visiting rooms and chapel to our comfortable coffee lounges that can also accommodate receptions, family and friends are made to feel at home the moment they arrive by our caring and professional staff. Our chapel can accommodate seating for 150 people, including a separate family room if so desired, as well as additional overflow seating for 75. We are conveniently located seconds north of Hwy 401, just 15 minutes east of Oshawa and 30 minutes south of Peterborough, with ample on-site parking and wheelchair accessibility.